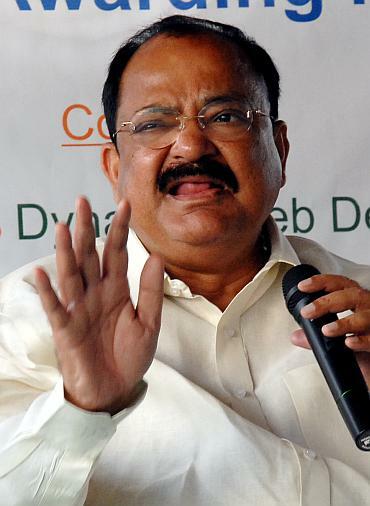 Congress has moved a notice for privilege motion against Parliamentary Affairs Minister Venkaiah Naidu, alleging that he misled Lok Sabha over HRD ministry's circulars on celebrating Atal Bihari Vajpayee's birthday on Christmas as 'Good Governance Day'. Congress MP K C Venugopal met Lok Speaker Sumitra Mahajan on Wednesday and moved the notice for privilege motion against Naidu, party sources said. Venugopal has said in the notice that the HRD ministry had issued 3 circulars to CBSE and Navodaya schools and universities, contrary to government's claim that no circular to celebrate 'Good Governance Day' on December 25 was issued to Navodaya schools, they said. Congress MP Jyotiraditya had said that if the ministers were found to be "misleading", his party would use "all options" including a privilege motion. He had said that the government has several times said in Parliament and outside said that no circular was issued. According to the Congress, three circulars were issued and first circular was issued to the CBSE schools by the HRD ministry on December 9 to celebrate Good Governance Day. Another circular was sent to Navodaya schools on December 10 and was asked to carry out same activities. Then a third circular was issued to all universities, including the IIMs and IITs on December 12 to celebrate this day," Scindia had said. The Congress has asked the government to come clean and give an explanation over the issue.